Koers & Vaart - the Dutch expression for Course & Speed - is an independent firm for maritime consultancy and naval architecture. We utilize our knowledge and experience to bring added value in strategic consultancy and project management for maritime companies and organisations. Together with our clients we implement changes, improvements and innovations. We support our clients in managing changes and offer solid solutions for complex problems. Next to strategic consultancy we also provide project management skills and capacity and interim-management. 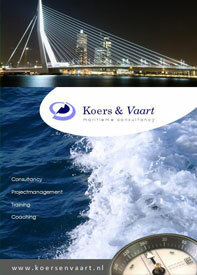 Koers & Vaart functions as a network organisation with short communication lines. We stand for enthusiasm, quality, creativity and results.